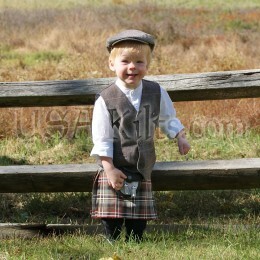 USA Kilts Carries Kid-size Kilts and Sporrans for Even the Smallest Celt! Now the whole family can kilt up together! Our Kid's Kilts are durable and comfortable for young children, even toddlers. 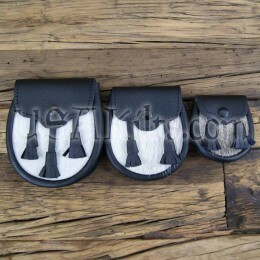 Unlike some makers, we do not use acrylic blends in our youth kilts. Our British-made PV material is hypoallergenic, low-pill and easy to machine wash. It's even Teflon-coated for super stain resistance! Mud? Food? Spit-up? Not. A. Problem. Two-inch growth hem included! Can I Get a Kids Kilt in My Family Colors? Yes! Our Poly-viscose tartan gallery includes over 100 tartans including Irish and Welsh. OR choose from the thousands of options in our wool tartan gallery. If you need something a little more refined looking or want to be absolutely sure your ring-bearer's kilt matches the groom's, We can help. Just call or email us for pricing info. Play as Hard as You Want! Have a future Highland athlete on your hands? 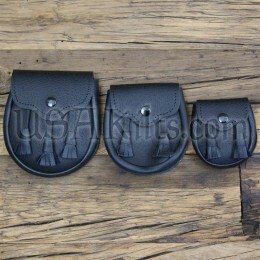 Just like our Casual Kilts, USAK kids kilts come with an easy-on easy-off Velcro closure system. You won't have to fight to get little Angus dressed before the family photo shoot. These kilts are made with the same durability and attention to detail as our other products, so he can really beat it up! No matter what sport (or trouble) he is into. Much More Than Just a Costume. Whether it's for a wedding, a family photo or a vacation to Scotland, we know you want to do it right. We are ready to kit out the younger members of your clan with durable kilts and accessories they will enjoy using again and again. For instance, our kids sporrans are real sporrans, not toys. Our fabric is made to last. We don't skimp. Best of all, some of our on-staff kilt makers are Dads, so we know what we are talking about when it comes to kids clothes.